Old Mutual Kenya (OMK) in partnership with the Kenya National Jua Kali Cooperative Sacco has launched an affordable insurance service dubbed ‘Heshima Mpango Poa’. The new plan is targeted at low-income workers in the informal sector who are currently not covered by burial insurance. Old Mutual will act as the underwriter to the low-premium service, which has undergone an intensive monthly-long research on its viability in the robust Jua Kali Sector before being unveiled. Chris Nyokangi, Old Mutual’s Commercial Director described Heshima Mpango Poa as a product partnership that would certainly facilitate the delivery of micro-insurance services in the country. 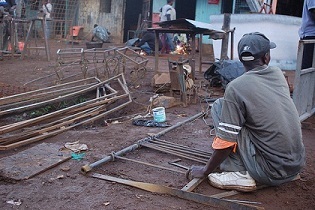 The Jua Kali sector accounts for nearly 75 percent of Kenya’s job base and contributes around 18 percent of the country's Gross Domestic Product (GDP). The Burial Insurance will offer cash benefits to members after the death of a family member. It is based on simple mobile phone software through which members’ data will be captured. The affordable insurance services are available to everyone over the age of 18 years and the low premiums are paid in denominations of Sh350, Sh700, and Sh1400. Registration is through the various mobile money platforms, M-Pesa, Airtel Money, Orange Money, and Yu Cash after which one will be provided with a policy number and the premiums.